Deep penetrating, fast acting, It's Amazing™ is a low viscosity liquid that you simply rub into the affected area 2-3 times daily for powerful pain relief. Very little odor and absorbs quickly into the skin. No menthol, capsaicin, camphor, or other strong smelling ingredient to offend others around you. 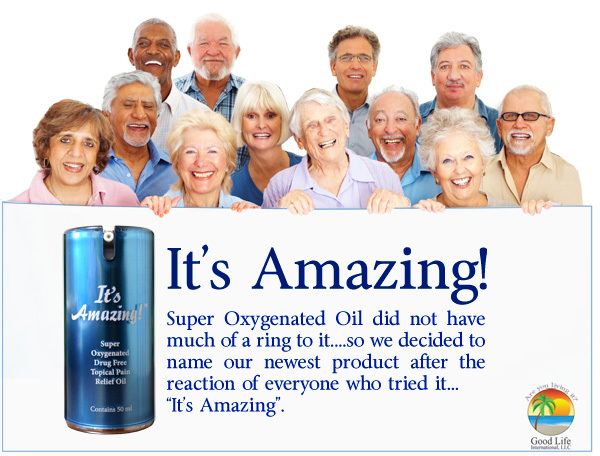 It's Amazing™ is an all natural yet potent antioxidant that safely funnels pain receptors with oxygen. It's Amazing™ transports oxygen molecules to areas deficient in oxygen. By increasing oxygen in the cells, It's Amazing™ reduces chronic pain pathways and restores cellular homeostasis.